When the Sketchfest lineup was announced, the act that I was most excited to see was BriTANicK. When tickets went on sale, the first tickets I bought on the light rail to the airport in Salt Lake City were for tonight’s show at the Eureka Theater with BriTANicK and BOAT. The show was hilarious. BOAT’s three man sketch comedy team did about forty five minutes after an opening stand up set from Anita Drieseberg. Anita’s set was mostly about WiiFit and was very true to life, as well as being funny. BOAT did a lot of funny stuff, poking fun at adoption, child molestation, fight scenes and pulp detective shows. There was a brief ten minute intermission before the BriTANicK headlining set, which had Nick standing on the armrests of the chair of the woman in front of me, and him next to me for a portion of the final bit that ended in a kiss. Describing the actual event wouldn’t do it justice; the reviewer from Spinning Platters wouldn’t do it either. 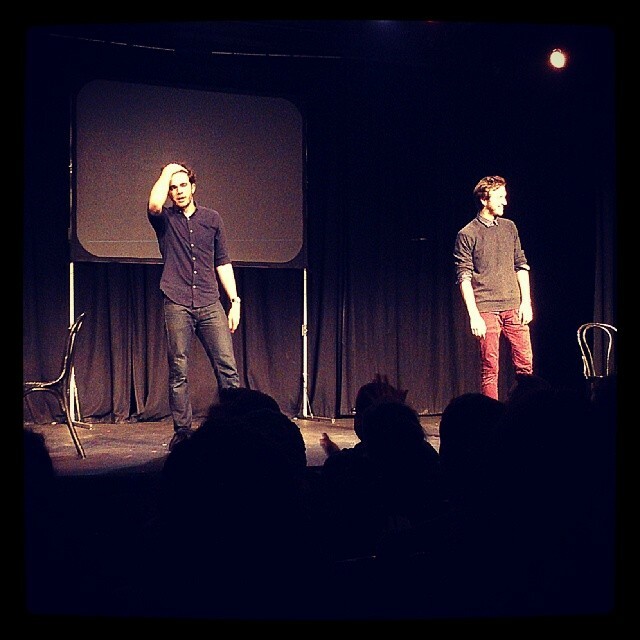 It was a fantastic show and was so far my favorite Sketchfest performance. Post-show we got to meet Brian and Nick, and I said hello to BOAT and Anita. The Eureka is a tiny theater, and I am very happy we got to see such funny comedy stars in such an intimate venue. January 29, 2014 in Event.